A quick trip to the greenhouse to grab some tomatoes for dinner last night, but I came back with more. 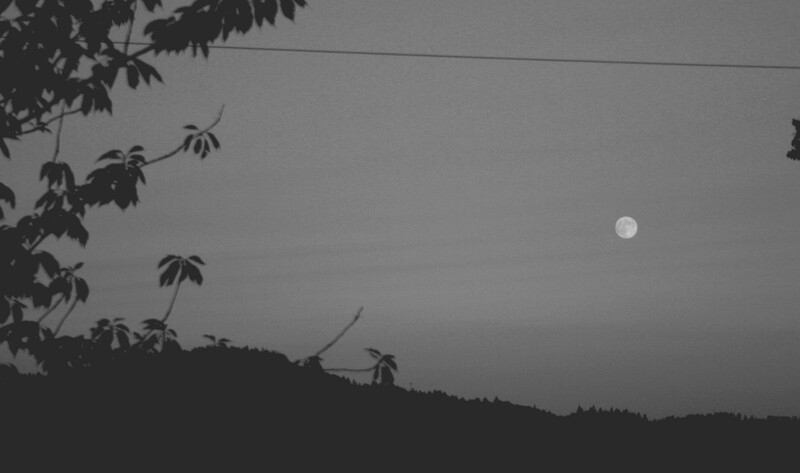 A gift given~golden light and the big moon rising. A chance to see things from a different side. Me on fire like the grass, ablaze from the sun, but in shadow, so still. Perfect. I almost always watch the sun set from our home. 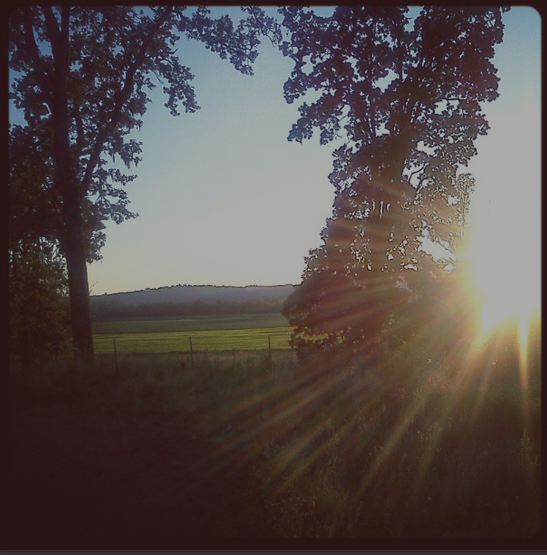 Last night, on the other side of the farm, it was a different view. A new perspective. Waking on Saturday morning to find the pet snake escaped, the snake whom I was only barely convinced I could, in fact, share a home with, unseen, and my skin so uncomfortable from then on, I should have known it would be a challenging weekend. Challenging in everyday kinds of ways. Challenging in big ways. Bickering kids, disagreements in finding things for everyone to enjoy, struggles with finding time to get some work done too. Heath concerns and questions. That whole day was a wash that I couldn’t wait to be clean of. Sunday, we mellowed. We found the snake. We worked together and played together and ate coconut-lime ice cream. We swam. 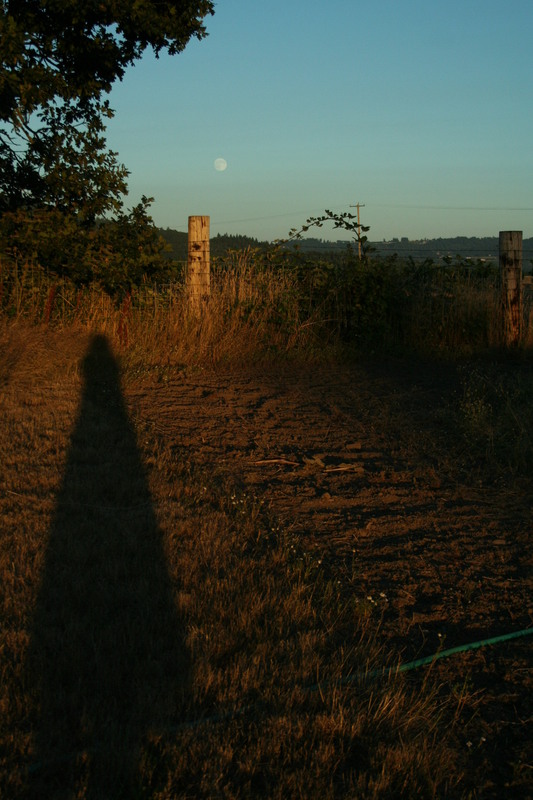 And then, just to really top it off and clear the gunky residual of any tension that remained, five minutes of quiet out in our field, just me and the moon and the last kiss of the summer sunset. It only becomes more clear to me, as time passes, that in this life we have to be able to hang with both of these kinds of days. The good ones and the bad. The flow and the ebb. And I don’t have a hard time with this in theory, at all, but I do have a hard time with this in practice, if only because I feel the pressure of the world around me, not allowing for such. And maybe it shouldn’t. I want to say that on our shadow days we get a free pass to get less done, slow things down, and just do whatever it takes to make it through that day. But we have to do more than that, everyday. I probably shouldn’t have let the tiny troubles of our Saturday make such a big impression on me. I don’t know. But when I let it all go last night, as I centered myself between the moon to the east and the sun to the west, I knew this for sure, that it feels a whole lot better now than it did then, thankfully. And I knew, just as certainly, that no matter how wonderful, I could not hold onto that perfect moment forever, make it last, forever. I could only breath it in and hope to keep it stored up inside me to call upon the next time I needed to remember so much goodness and beauty, and me, a part of it. And that the flux, the vacillating, only helps me to feel so damn alive in such a moment, squared off with the heavens. Yes, that is lovely and true. I love Anne Dillard. Thanks for sharing!